Today I'm showing a Halloween card for the Just-A-Scrappin' Challenge 9-19-2013 CRITTERS. Create a card or LO using animals as the theme. Your card is spooktacular. You did a wicked awesome job. You sure were ever so clever and creative with everything you put together to create your cool card. Great job!! I agree with Joan! Wicked awesome! I love cards that tell a story. 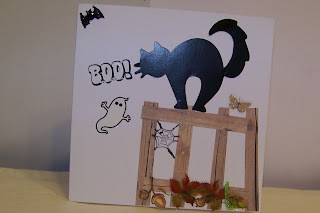 Cute Halloween card-I LOVE that fence!